Helen Louise Culpepper, Cert 115687, Highlands Co., FL, White, 14 Feb 1908 - 04 Oct 1993. Obituary of Marilyn L. Culpepper, 14 Dec 2004. Millie D. Culpepper, Daughter, F, 2, Sng, FL/GA/GA. Obituary* 5 Aug 2016� Homer G. Culpepper, age 78, passed away on July 30, 2016 in Avon Park, FL. He was born on August 7, 1937 in Sebring, FL to the late Homer G. and Josie Mae (Ryals) Culpepper. Homer was a life-long resident of Avon Park, FL. He is survived by his children, Sallie (Gary) Barton of Avon Park; FL, Patricia (Amy) Culpepper of New York, Grayston Culpepper of Avon Park, FL; eight grandchildren; and nine great-grandchildren. Homer was preceded in death by his wife, Glenda Culpepper and sons, Homer J. Culpepper and Robert Dane. A Memorial Service will be held at 1:00 p.m. on Saturday, August 6, 2016 at God's Family Assembly in Frostproof, FL. Obituary of Homer J. "Tater" Culpepper, 28 Aug 2004. I believe he [Homer L. Culpepper] is buried in Okmulgee Cemetery in Okmulgee, Ok. He had a daughter, Doris from a previous marriage. I don't know too much more about his family. After he married Jessie, he and Calhoun struck it rich drilling for oil and started a business together (Cal-Cul Oil I believe). There were so many springing up at that time. Homer loved his hunting dogs and fast special built cars. They had a VERY nice home in Tulsa, OK and entertained a lot. It had a bar built the length of the front room and a wine cellar. My grandmother (Jessie) would have chefs flown in to cook for her parties. Although he bought her jewelry, furs & a new car every year, he chose the car but never let her have any cash. Which probably saved her life. More than once she was accosted at gun point by someone demanding money (during the depression there were so many desperate people) and she had nothing to give, even offering her jewels & furs. She like to play Bridge and found it embarrassing not to be able to put money in the pot but Homer wouldn't let her have money but would buy her anything. 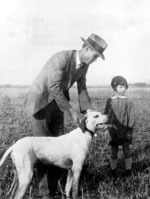 He was very specific about his hunting dogs as well and mother was only allowed to have one or two, the rest were not to be petted and were kept away from the house in kennels. Homer's penchant for fast cars finally did him in. According to the story I was told....he was out driving in one of his fast special built convertible cars when a lorry (truck) pulled out in the road in front of him and he swerved to avoid it but his car flipped over into a ditch killing him. His partner Calhoun took off to Europe with all the money and my grandmother didn't know about till she woke up one day and the bank told her she was bankrupt! She had to sell all her jewels and possessions to survive and raise her daughter alone. Mother said before they sold the house, on days when it was still, you could hear the front door bang & footsteps mount the stairs at the time when Homer used to come home. My mother was around nine when he died...maybe around 1930. Mother & I tried to find the house when I lived in Tulsa but I believe it burned down. I'm sending the only picture that survived through the years of Homer, my mother, Bobby, & Snow one of the dogs he allowed her to have. E-mail written 2000-2002 to Lew Griffin from LaDawn Wells, e-mail address. See Biographical text for Homer L. Culpepper.